On a frosty evening in January at a BCCCB meeting it starts with 2 words -waddabout Windsor? And there are responses like Yah for sure; definitely; maybe we could do more; and so on. 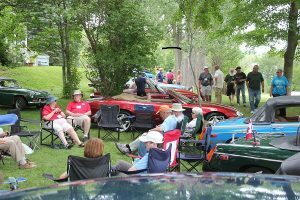 As the winter progresses and the storms drive us deeper into memories for relief we see “Windsor” as a dream come true – like minded, fun spirited car enthusiasts gathered for a party like no other. And each meeting sees the trip grow bigger in our plans…at least a week of exotic touring and so on. By April when rooms must be booked and cars are being examined in dusty cold sheds the words ‘waddabout Windsor’ start to bring out -yah maybe; I’m not sure about my brakes; [s]he may not have the time; the car has — problems. The excuses are followed by strong words about the fun, need to support and how others really should make the effort to attend. Well last weekend was the proof of concept and implementation. 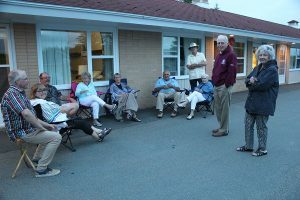 Twenty-four members responded to roll call and breakfast on Sunday morning in Garlands Crossing. That is where the Crossroads Restaurant and Downeast Motel are. And may I say the vehicles did well. Some members showed a few wounds though. 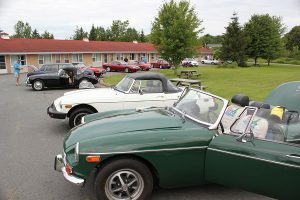 We started the assembly on Thursday with 7 cars leaving Cape Breton and 2 leaving Hfx/ Bedford. By Friday a second run of vehicles left from the Sydney area and we came to full strength by Friday afternoon. 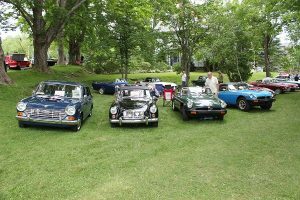 Joe’s Alpine, Carol’s Healey, Susan’s B, Mary’s B, John’s TR 6, Bob’s B, Billy Mac’s Crab, Peter’s XJS, Brian’s A, Preston’s Jag ride, Norm’s B, Haylett’s 3000 & Alf’s treasured B. 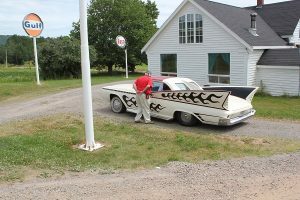 Those who left Thursday had lunch and a bit of shopping in Pictou and continued their touring Friday as smaller groups sought out ice cream, cider, wine, antiques and the Green Goblin…ask Joe about that. Lunch followed at the Edible Art Café… “Thanks Arlene” for that tip. Then off to scrong and scrap fun from the Valley landscape. 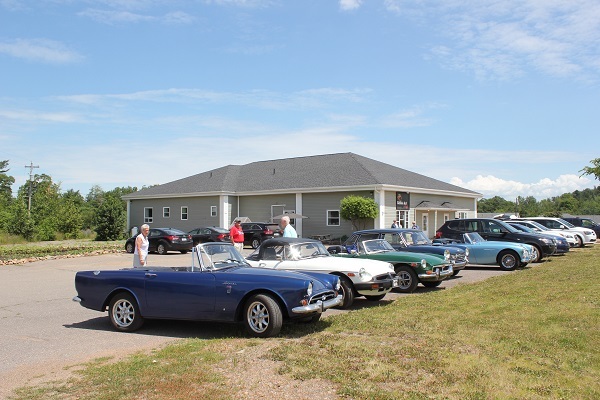 By Friday night we had a big BCCCB group at the Spitfire and we adopted a couple from Sackville NB who were at BMF for the first time to dine with us. Bill MacD was on his toes solving problems before others saw them and this he did all weekend. Thanks Bill for the leadership and initiative that helped us all have more fun. Saturday morning we slowly assembled the BCCCB group in a shady spot backed by a hill. 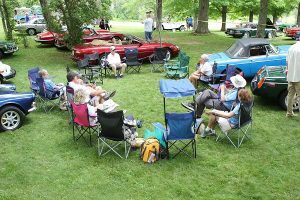 The new layout for BMF meant many people had to be helped find their spot. The volunteers from BCCCB were a key part of the success. Donna and Alf were at the corner sending vehicles left right and center! Bill and Bill had flags and waved them with great authority until all vehicles were parked. Haylett joined the flagging fun which never really flagged at all! Brian helped place the teams. We parked more cars than usual in a smaller space. I hope that is a compliment….As well there was time on the gate selling tickets and entertaining visitors. Supper followed and that too required coordination of taxis, seating and parking lot parties. Thank you to all who stepped up to lead and pay. One hundred fifty-eight (158) vehicles were registered and about 1000 people paid at the gate…a great success. It is only possible because there are many volunteers. The organizers did say thank you many times as we plugged the gaps with skilled, willing bodies. Billy Mac deserves special note for helping and for picking up on needs throughout the day. He filled the role of BCCCB leader well and we thank him. The food was generally great and the wine and beer usually met the consumers’ needs. As to the cars- Brian, what happened with the brakes? Bill e why the smell of gas? And Haylett, the late night push start?? There wasn’t a Crab, it purred like a kitten and did double duty as the team bus Friday. I think the trip home showed the confidence we have in our cars is growing. There were BCCCB cars going off in all directions, no need for a support team prepared to do roadside maintenance. 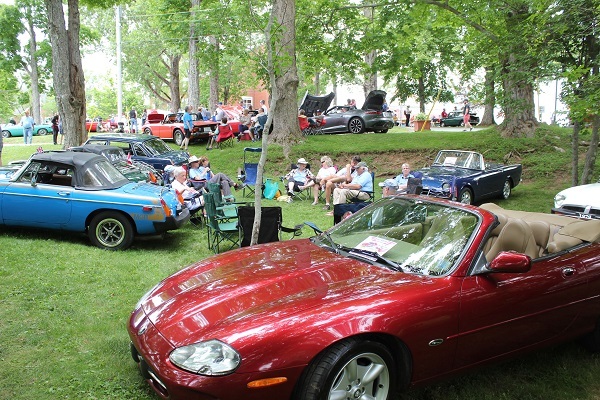 All the cars are home under their own power and driven proudly by the owners. Who is going next year? It will be the 10th anniversary of BMF? May I start with “Oh yah we’ll all be there”.